2.1 Political Europe is at stake. 2.2 Sarkozy wants to propagate “graduated response” to Europe. 2.3 The French “graduated response” (Olivennes Law or HADOPI, translated here) is a bad and dangerous law. 2.4 Amendment 138 blocks the French law. 2.5 “Telecoms Package” shouldn't regulate content. The French president Sarkozy, currently also President of the European Union, will allow arbitrary restrictions of fundamental rights and freedoms, including the right to “receive and impart information and ideas without interference by public authority” (Fundamental Rights of the European Union, Art. 11). 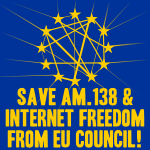 The way Sarkozy want to attack freedom (and particularly freedom of expression) on the net is by having amendment 138 of the Telecom Package removed on Nov. 27th when the Telecom Package is on the agenda in the Council of the European Union. The European Parliament voted for the Telecom Package on September 24th. In the package, the notion of “lawful content” is present many times guaranteeing access only to "lawful content". This implies that access to content allegedly "unlawful" could be restricted. Amendment 138 ensures that only under special circumstance may restrictions be imposed on the rights and freedoms of end-users without a prior ruling by the judicial authorities. Although amendment 138 was voted by 88% of the elected Members of the European Parliament, it is unacceptable to Sarkozy and his allies. On Oct. 30th, the French Senate voted in first reading a law implementing “graduated response” against alleged file sharers, that Nicolas Sarkozy personally promoted. This law gives an administrative authority the power to close citizens' internet access without a trial. By removing amendment 138, the French President plans to propagate “graduated response” to the whole Europe. Amendment 138 will block this propagation of the French “graduated response” to the rest of Europe and make it illegal in France. To counteract Sarkozy's attack on freedom of expression, Citizens from every Member State are invited to write an open letter to their representatives in the Council in order to inform and urge them to vote against any attempt of deletion. The European Commission accepted amendment 138, stating that it reaffirms basic principles of European law. But, the Council of European Union, under heavy pressure, may be about to delete it from the directive in its first reading decision of Nov. 27th. Such a removal, opaquely negotiated, would represent a bypass of the democratic European institutions by the French Presidency in order to better serve the interests of Vivendi and the French cinema (SACD). It is crucial for European Democracy that this amendment remains in the “Telecoms Package” and that transparency is cast on this process. Every citizen can help. You can refer to 14-pages brief published by Open Rights Group for an extended legal analysis of the various Directives that make up the Telecoms Package (as amended by Parliament in September) and the reactions to these amendments from the Council of Ministers and the Commission. Political Europe is at stake. The European Parliament is the representation of the European People. It decided by 88% that only a judge can impose restrictions on fundamental rights and freedoms of citizens. Many stated that this recalls as a basic principle of European law (eg. MEP Catherine Trautmann, Commissioner Viviane Reding). Political Europe can only be achieved if the will of the People is respected. The executive body (the Council of EU) cannot just “remove” a decision taken by 88% of the Parliament and approved by the Commission. Putting light on the European lawmaking process is useful. 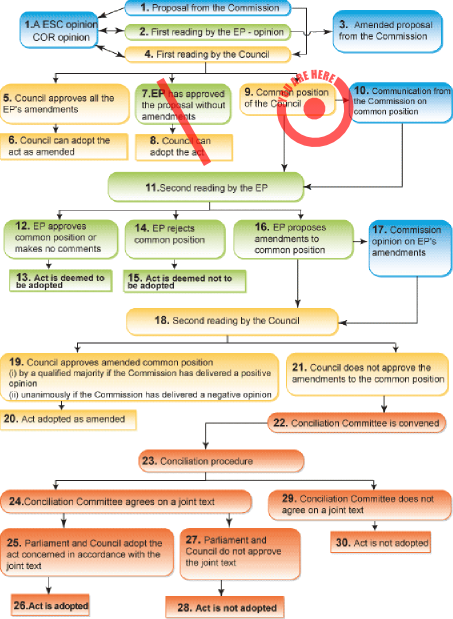 The decisions of the Council of EU are often opaque and the Council representatives may negotiate their votes. It's important for people to know and understand what their country stands for in this debate. Attracting citizens and press attention on the process can help achieving this goal of better transparency for the European institutions. Sarkozy wants to propagate “graduated response” to Europe. MEP Ruth Hieronymi argued, on a conference held with Vivendi representatives in the French embassy in Berlin, that “the legal framework is there, to fashion a model like Olivennes that is compatible with European law”. The content industries (Vivendi, French cinema represented by SACD) lobbied hard for the “graduated response” to be propagated in Europe. The French “graduated response” (Olivennes Law or HADOPI, translated here) is a bad and dangerous law. An administrative authority acts upon flaky immaterial “evidences” of counterfeiting provided by the content industries. Its inquiries involve access to stored connection data containing personal data. It sends personalized warnings to the alleged infringers. Those automatic, heavy accusations cannot be appealed. Upon recidive, the administrative authority orders internet access cut (with interdiction to get a new access.). Innocent people will inevitably be disconnected while many people will use encryption and anonymization to evade the law. This law doesn't add a single extra cent to the creators' income. Amendment 138 blocks the French law. “Telecoms Package” shouldn't regulate content. The innovation models of the digital environment are based on the essential principle of “network neutrality”. You cannot ask the operator to judge what content shall go through their networks. The notion of “lawful content” is present many times in the whole text. Guaranteeing access only to "lawful content" implies that access to content allegedly "unlawful" could be restricted. Who would determine what is lawful or unlawful if not the judicial authority ? Ensuring that amendment 166 remains in the Telecoms Package is an important safeguard against filtering of Internet Content. Rejection of amendment 112 is also important, because it lays the tracks for implementing the graduated response in Europe, as a cooperation between ISPs and rights-holders ("sectors interested into the promotion of lawful content"). The Council of European Union shall vote and issue its opinion on Nov. 27th. Each Member State's representation shall take its decision before that meeting. The earlier the contacts will be established, the more chance there will be to attract press attention and to obtain an answer. Identify the minister in charge of the Telecoms in your Member State. (Also identify whether it acts upon a mandate by the national parliament or not, see below.). The concerned configuration of the Council is probably "Transport, Telecommunications and Energy Council (TTE)". You can also contact your country's permanent representation in Brussels. Write a short open letter to him asking to vote against the deletion of amendment 138 (Framework Directive, Article 8.4.ga), and asking for an official position. Also ask about keeping amendment 166 (Universal Service Directive, Article 32a), and removing amendments 61 (Framework Directive, Article 8.4.g) and 112 (Universal Service Directive, Article 33.2a) that both lay down the tracks for graduated response. Phone to the ministry 3 days after having sent the letter to know how it is being received and processed, and when answer shall be given. Fill-in the wiki to add your actions to the list of actions taken. Do the same with the chiefs of the major political groups in your national parliament. They can easily have direct contact with the concerned minister. It might not be easy to get an answer from the minister but it is worth trying. Getting democratic and media attention on the issue is important. Different rules apply in different Member States. In some countries (France, ?, ?, ? ), the representative has full initiative and doesn't account to anyone. In these countries, you shall directly call the Ministry, and ask for the office in charge with representation in the Council of EU. In other countries (Belgium, Netherlands, ?, ?,... ), the representative comes with a mandate from the national Parliament. It means the Parliament controls what the country says in the Council. In these countries, you shall contact various the political groups from the parliament, and ask them to mandate the representative in the Council for asking to keep amendment 138. You can contact your representative as an individual. It might have more weight if you do it on behalf of a non-profit organization, a company, or as an academics. It can even have more weight if several NGOs, journalists, etc. ask the same question. Once it is sent, publish and send your open letter to the press. Aim in priority for the journalists and media that covered the previous steps of am.138. A List of participants to the Transport, Telecommunications and Energy Council (TTE) of the Council of EU. The 14-pages brief published by Open Rights Group for an extended legal analysis of the various Directives that make up the Telecoms Package (as amended by Parliament in September) and the reactions to these amendments from the Council of Ministers and the Commission. Press realease by La Quadrature du Net: European citizens: mobilize to block Sarkozy's "graduated response" at the Council! Press realease by La Quadrature du Net: Say no to Sarkozy's European takeover! This page was last edited on 25 November 2010, at 13:03.